The Nuclear Medicine Department in the Faculty Hospital in Nitra commenced its operation in 1986 with the RIA Laboratory, followed by simple examinations on available devices. In October 1, 2004 the department became independent from the Faculty Hospital and started operating as IZOTOPCENTRUM, s.r.o. – Nuclear Medicine Centrum. We provide services for around 1 million inhabitants, i.e. the entire Nitra Self-Governing Region and adjacent counties. Some examination methods are only carried out by us in Slovakia, while in others we belong among the 3 or 4 departments able to perform them. The range of examinations is wide and essentially includes all the available examinations in the field, namely oncology diagnostics, cardiology, pneumology, nephrology and special treatment methods. Nevertheless, our participation in navigated surgeries is also quite essential as well. 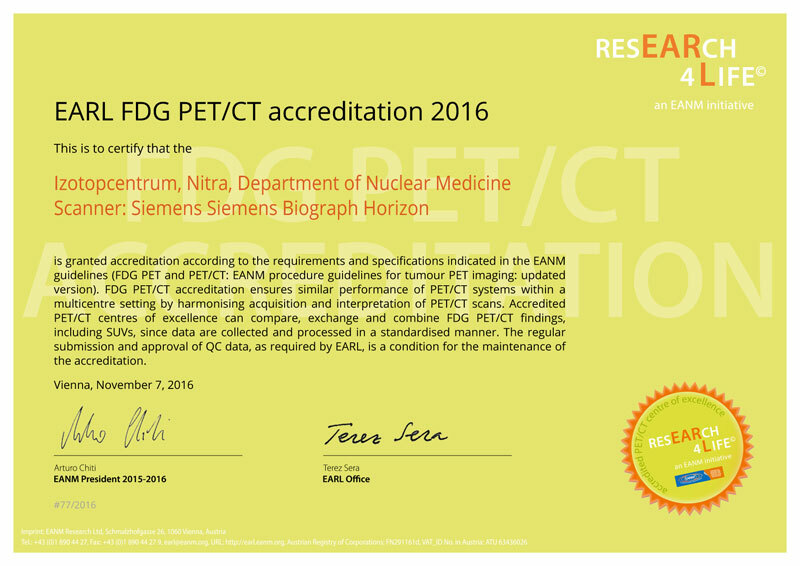 In order to follow trends in the field it was necessary to upgrade equipment that was already morally obsolete and firstly expand the department’s scope with new examination trends with the use of positron emission tomography (PET/CT), which allows significant improvement and increased accuracy of early diagnostics as well as the monitoring of treatment success, in particular with oncological diseases. The first innovation was performed in 2006, when we started to work with the then new Siemens devices: the Biograph Duo PET/CT scanner and E. Cam SPECT scanner. The new innovation was carried out along with the move to the premises on Rázusova Street in 2014, where the “original” equipment was complemented with the latest generation of devices, again by Siemens: the PET/CT Biograph 40 and SPECT/CT Symbia Intevo. In 2016 we replaced the PET/CT Biograph Duo with an entirely new PET/CT Biograph Horizon device from Siemens. At the time of installation it was the fifth such device in the world..
We have a well-established and maintained quality management system in compliance with the model and requirements of the ISO 9001:2008 international standard. December – we are the first in Slovakia (and neighbouring countries) to perform the newest PET/CT examinations in the world with 68Ga-PSMA targeting prostatic carcinoma and 68Ga-DOTA peptides used for neuroendocrine tumours. August - new colleagues/physicians joined our team: Dr. Cristina Paschetta and MUDr. Tomáš Pintér. July, August – installation of the new Biograph Horizon PET/CT scanner by Siemens, replacing the Biograph Duo. January – introduction of 18F-choline examinations in Slovakia. 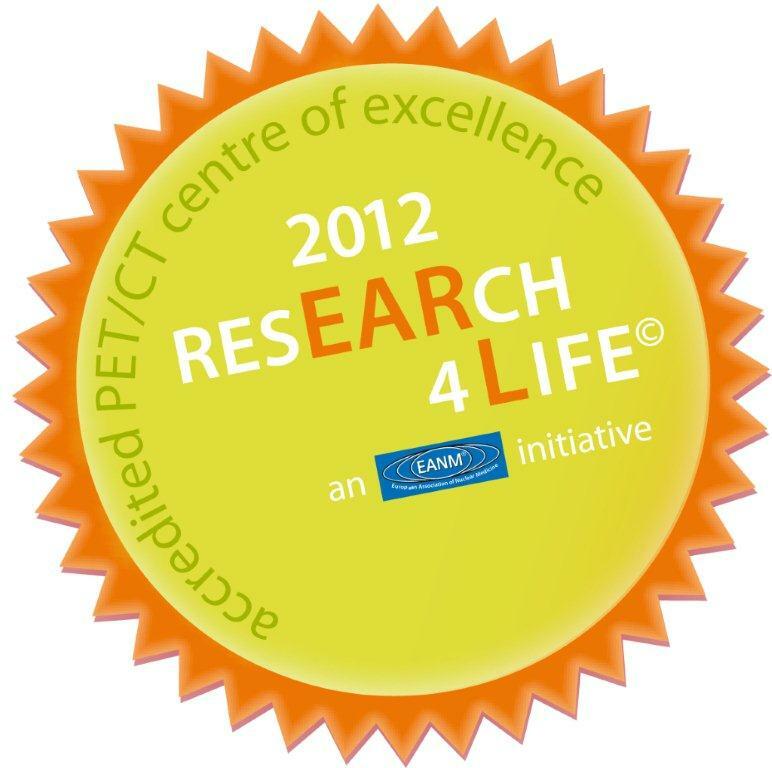 The examination is used for diagnostics related to prostatic carcinoma, hepatocellular carcinoma, etc. We organize the 44th Nitra Nuclear Medicine Days with international participation, after a Slovak-Czech event once again after several years. May – digitization of MB 9200 gamma camera with the option of whole-body examination. MUDr. 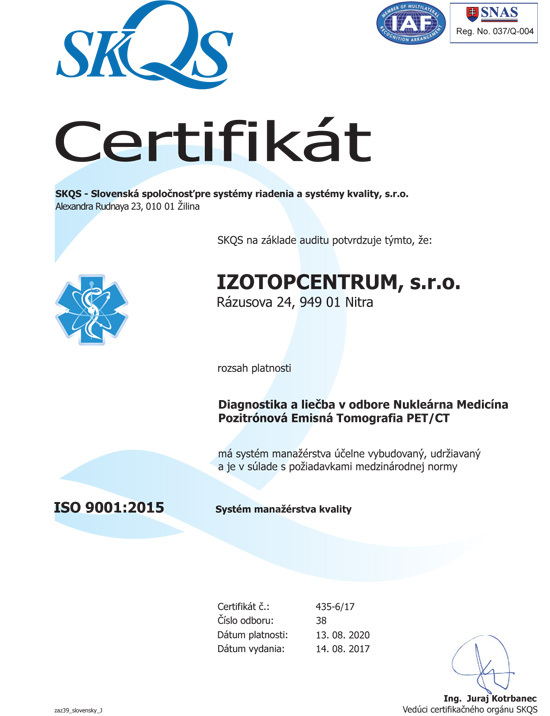 Soňa Kurucová successfully completes attestation in nuclear medicine. 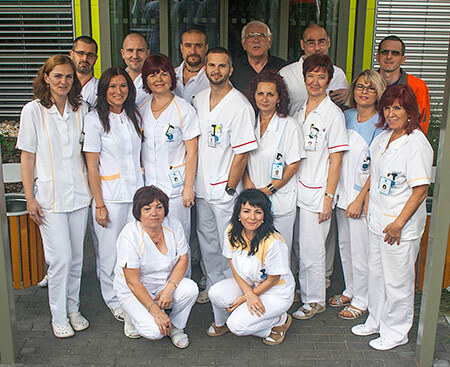 December – commencement of relocating the department from POS in Chrenová to the oncology department in the hospital area. November – celebration of the 10th anniversary of the department’s establishment, together with the very first all-Slovak nuclear medicine seminar with international participation, herewith founded. March – RIAMAT semi-automatic RIA evaluation device that greatly improved the possibilities of in vitro diagnostics. September 1 – closure of the department due to economic reasons. Operation continues after their resolution by donations. October 12 to 14 – we organize the 26th Nuclear Medicine Days, a nationwide event with the participation of 350 nuclear medical professionals from all over the Czechoslovak Socialist Republic. The event is among the most successful in history to this day. Christmas – MB 9200 gamma camera made in Hungary. Its operation is launched in February 1989. Christmas – Gama 8100 gammagraph made in Hungary, whose operation began following its installation in 1988. September – first results from the RIA laboratory, first examinations on a single-probe set: thyroid gland accumulations and on a double-probe set – radio-renography and accumulation fibrinogen tests.